For the second time in franchise history, the Lakers have three young studs selected to represent in the Rising Stars Challenge. While Lonzo Ball will not suit up for this year’s edition at STAPLES Center, Brandon Ingram and Kyle Kuzma will look to represent for the hometown squad. Here’s a look at all 12 Lakers representatives for the game between top rookies and sophomores. 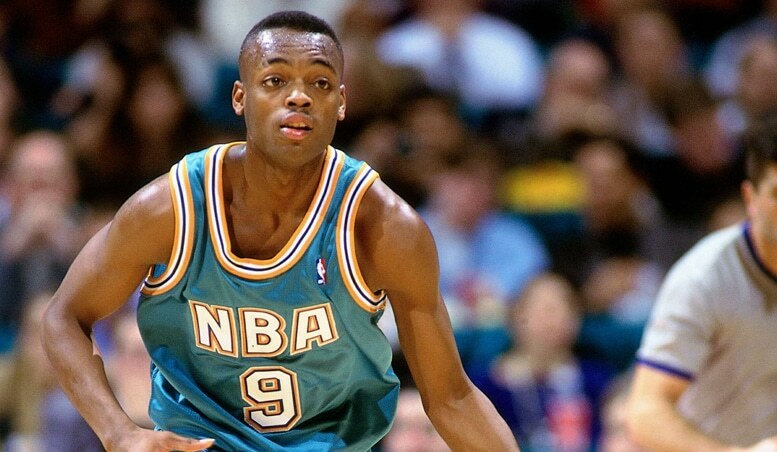 At the inaugural Rookie Challenge in Minneapolis, Van Exel couldn’t find his way onto the scoreboard, missing all eight of his shots for the Sensations team. However, the Lakers’ first representative did still leave his mark by handing out a game-high six assists. Yet the Sensations nonetheless fell, 76-68, to Chris Webber (18 points, 10 rebounds) and the Phenoms. 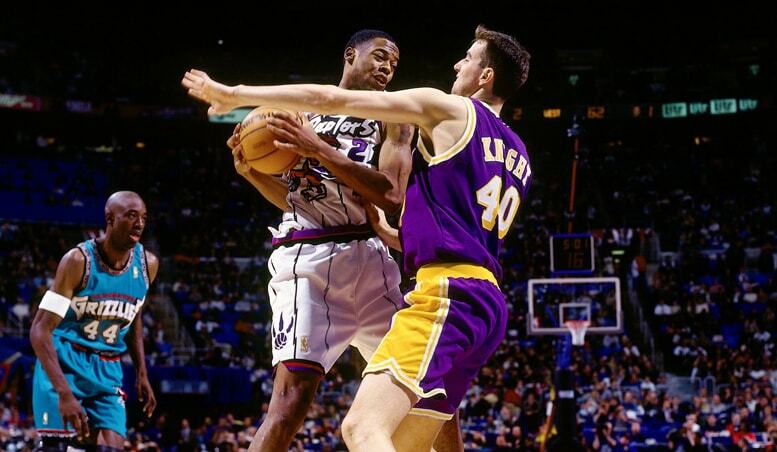 After the Challenge: “Nick the Quick” became an integral member of the Lakers for the next five years, even making the All-Star Game in 1998. 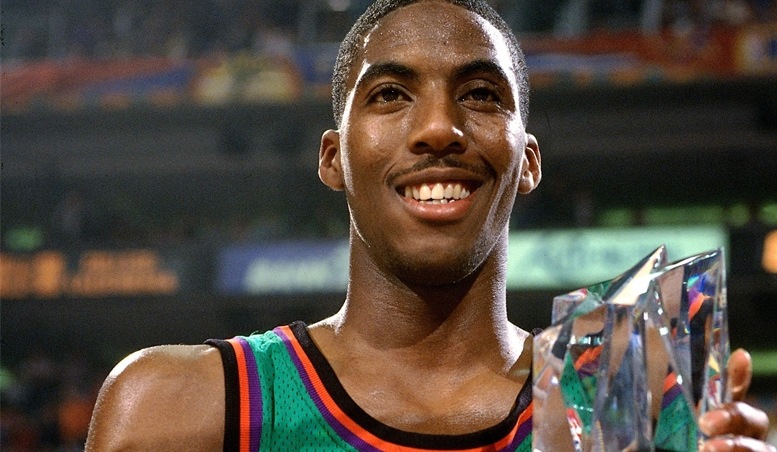 He was among the NBA’s top 10 in both assists and 3-pointers in 1995 and 1997. Though his Green Team fell in overtime, Jones was simply too dominant to not be named MVP. He dropped a game-high 25 points while picking up six steals and four assists. The lottery pick was particularly hot from beyond the arc in Phoenix, hitting four 3-pointers on eight tries. 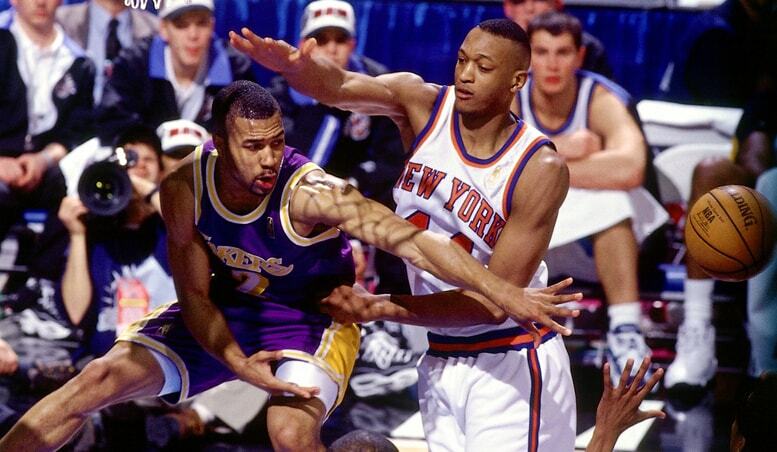 After the Challenge: Jones was named an All-Star for both of his final full seasons in purple and gold (1997-98). He’d earn that honor one more time for Charlotte in 2000 on his way to leading the NBA in steals. The 18-year-old future Hall of Famer let his fellow Rising Stars know what they were in for over the next two decades. He dropped a then-record 31 points while picking up eight rebounds, three assists and a pair of steals. Though he also had seven turnovers in the West’s 96-91 loss, Bryant made up for it by shooting 8-of-17 from the field and 13-of-16 on free throws. Allen Iverson (19 points, nine assists) took MVP honors, but Bryant would go on to own the night by winning the Slam Dunk Contest hours later. After the Challenge: Bryant’s career can hardly be summed up briefly, but it includes five NBA titles, 18 All-Star selections, a pair of Olympic gold medals, one MVP season and the third-most points in league history. As with the majority of their careers, Fisher was right alongside Bryant from the start. Also a rookie at the time, Fisher scored 16 points in 15 minutes while also providing a team-best six assists — many of which found their way to Bryant. After the Challenge: Fisher enjoyed an 18-year NBA career, which included an NBA-record 259 playoff games and five championships in Los Angeles with Bryant. The third Laker to represent at the 1997 contest in Cleveland was much quieter than Bryant and Fisher, but still productive. Knight pitched in nine points and four rebounds, while shooting 3-of-5. After the Challenge: Knight was named Second Team All-Rookie, but signed by Boston in the offseason. However, the Lakers traded for the 7-footer the year after, as he received a won a ring with the 1999-2000 team that began the three-peat. A decade went by before Bynum and teammate Jordan Farmar represented the Lakers at the Rising Stars Challenge in Las Vegas. Bynum tallied seven points and four rebounds to aid the Sophomores’ steamrolling of Farmar’s Rookies, 155-114. After the Challenge: Bynum helped the Lakers to championship banners in 2009 and 2010. During his lone All-Star campaign in 2012, he ranked third in the NBA in rebounds and sixth in blocks. Having been crushed as a rookie the year before, Farmar — the first Laker to play in two Rising Stars Challenges — was key for the Sophomores’ 136-109 rout in New Orleans. The 21-year-old seemingly had a hand in every play, piling up 17 points, 12 assists and four steals, while sinking three triples to counter 23 points from a rookie Kevin Durant. After the Challenge: Playing among the top young stars was nice, but Farmar’s following two years were much better, as he helped the Lakers win back-to-back titles in 2009 and 2010. After leaving L.A. with two rings, he returned for one more stint with the purple and gold in 2013-14. 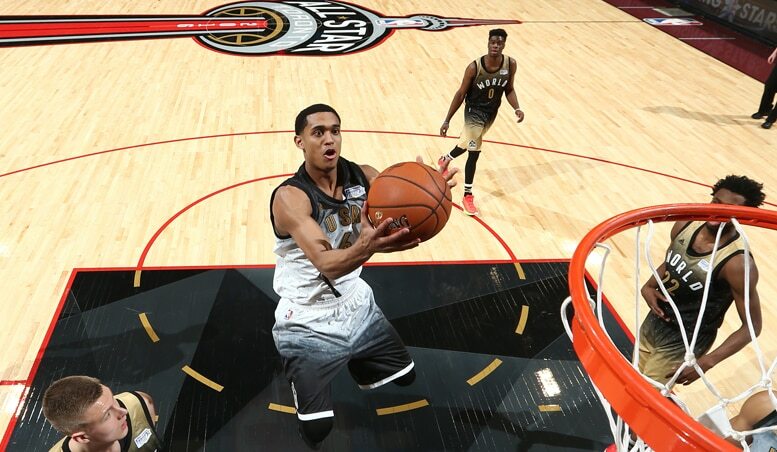 One year after falling to the 46th pick of the 2014 Draft, Clarkson affirmed his standing among the league's top young players by scoring 25 points with five 3-pointers. Clarkson hit four triples within the game's first four minutes and finished the night with a game-high four steals. He also helped keep the World Team at bay late by hitting four free throw attempts in the final minute. After the Challenge: Clarkson was one of the Lakers top scorers for three-plus seasons before being traded to Cleveland in 2018. Russell only played 16 minutes, but nonetheless was a key cog in the USA Team's win over the World Team in Toronto. He scored 22 points by shooting 9-of-15, while also leading his squad with seven assists. He scored 13 of those points and dished out all of his dimes in just nine minutes of first-half action. 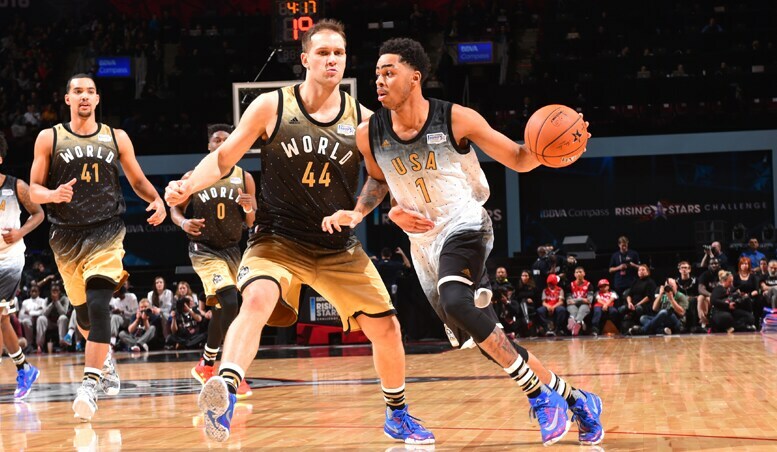 Russell took more of a back seat in his second trip, as the USA Team fell in New Orleans. He finished the night with 10 points, four assists and two steals. After the Challenge: Russell was named Second Team All-Rookie in his debut season. After his sophomore year, he was traded to Brooklyn. 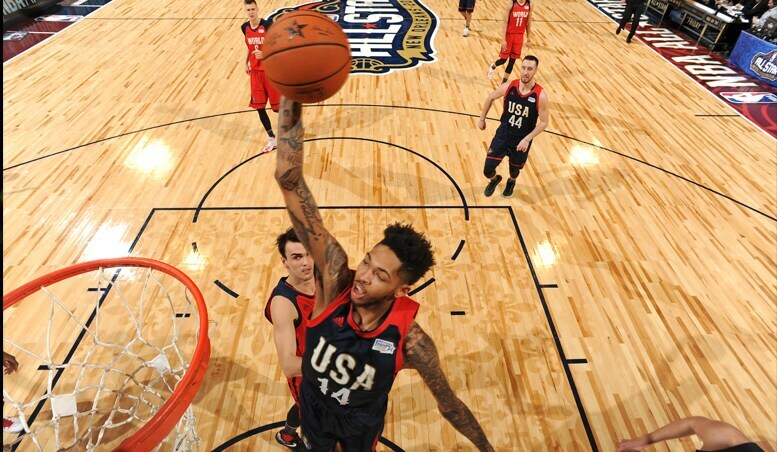 Despite making his first shot and also throwing down a fast-break dunk, it was a rather quiet All-Star Weekend Debut for Ingram. The 20-year-old pitched in four points and three rebounds while playing alongside Russell on the USA Team. Ingram returned for the 2018 Challenge, but (with the Lakers playing back-to-back games in the days before) played only 12 minutes and scored eight points. The 27th pick of the NBA Draft, Kuzma set the league ablaze in his rookie season, ranking second among first years in scoring (16.1) and hitting the fourth-most 3-pointers in rookie history (159). Kuzma — who was later named First Team All-Rookie — wasn't afraid to let it fly at STAPLES Center for the Rising Stars Challenge, scoring 20 points in 19 minutes. Currently third among sophomores in scoring, he will return for the 2019 Challenge in Charlotte. Ball was selected to two Rising Stars Challenges, but injuries prevented him from playing in either. Those ailments contributed to the second-overall pick being named Second Team All-Rookie, as he would've ranked among the entire NBA's top 10 in assists and steals if he had played enough games to qualify. Ball has shown similar effectiveness in his second year, while ascending among the league's top defensive guards.